It's that time again! 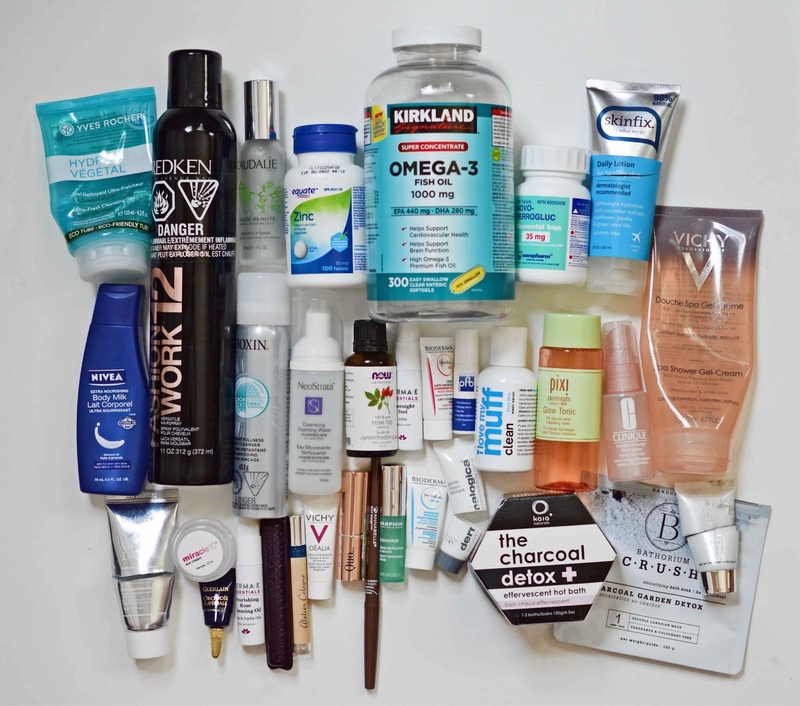 Here are some of the products that I've used recently, and the ones that actually made their way into my "finished products" bag, since not all of them do. Between travel and spending time at Joseph's place, then sharing items with my mom and sisters, here's what I've saved to chat about. Biocellulose masks are so fun to use, the very thin and jelly filament comes sandwiched between two firmer pieces of fabric or plastic, and they deposit a rich quantity of vitamins and hydrators to your skin. I used this on my way home from Vancouver and it dried up so much faster on the airplane than at home - just goes to show what airplane air does to our face without moisturizer on. It definitely helped to keep my face feeling plump, clear and oil-free during the journey, so I'll never travel without one of these again. As for the price, I think it's a bit too steep for my budget, but since they work well - use your best judgement. What a unique concept! And only slightly gimmicky, this charcoal sheet mask is not a simple hydrating film. Instead it works as a nourishing AND cleansing mask to exfoliate dead skin cells and reveal a healthy glow. 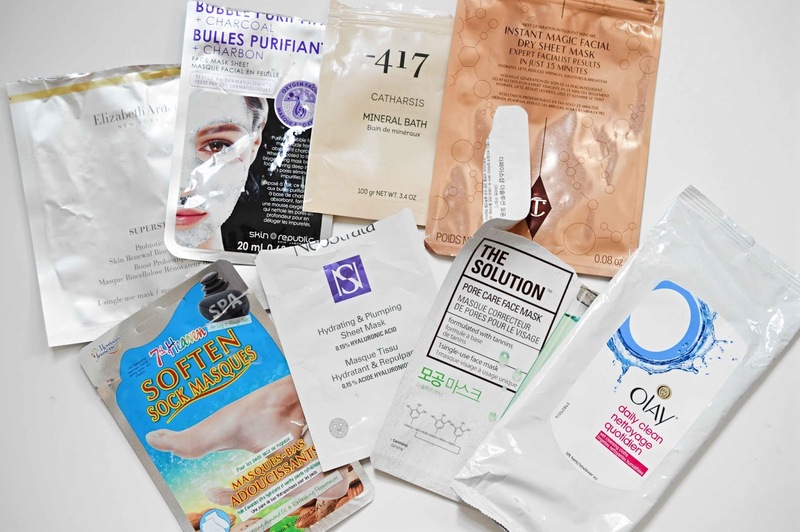 It will start to bubble once you remove it from the packaging and you need to rinse off the residue at the end (most sheet masks don't need a rinse until the AM). I found the mask texture to be a bit stiff and thick, but it did leave my skin looking really nice and clear. Sylvie, one of my besties, brought me back this Pure Dead Sea Salt from Israel earlier in the year. This product is enriched with the unique healing minerals from the lowest place on earth, the Dead Sea! I loved relaxing in a warm bath with these salts after a long day. Now that winter is coming around quick, it's a great idea to stock up on items like this to help you relax and fall asleep during our coldest months. Would recommend. 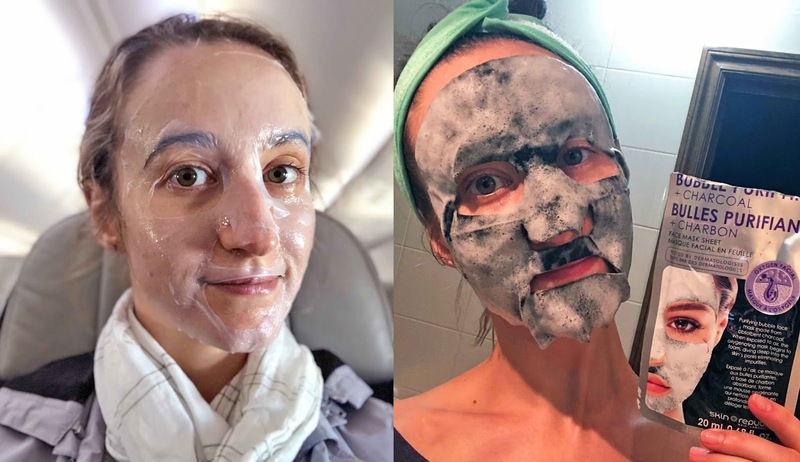 This "Hydrating" Dry Sheet Face Mask is a super unique concept, which is now gaining traction in the beauty world. Enriched with oils, this mask is completely dry and doesn't harbour bacteria between uses. You can use it up to three times, with benefits including more plumped skin, less fine lines and increased skin health overall. I don't really like this format of mask, I'd rather drop my typical wet sheet mask in a warm sink of water before applying (to avoid the cold wetness) and enjoy the jelly texture like usual. Yesss I love these! For only $6 your feet will feel like angels on earth. Simply slip on the socks and let them soak up the moisturizer. An incredible product with great results, so good for a true pamper day. This hyaluronic acid-based mask is very standard: it aims to rehydrate the skin and replenish its moisture barrier. I'd say that this is very comparable to classic K-Beauty sheet masks and would recommend it as a great option from the drugstore. I really liked The Face Shop for sheet masks, they aren't revolutionary but they are a great bang for your buck. This one aims to help calm and heal acne, while also preventing new breakouts. It worked well to leave me with glowing, breakout-free skin when I woke up. I ADORE the dry Olay Daily Facial Cloths, especially for travel (see why here) but I unfortunately don't like these wet ones too much. I find them to have a strong amount of fragrance and they don't work very well around the eyes - they can be too irritating. I'd stick with Neutrogena or Marcelle if you're at the drugstore. This cleanser reminds me a lot of the L'OCCITANE Aqua Réotier collection cleanser. It's a simple gel that works great as a second cleanse. Due to the fragrance and inconvenient packaging, I won't repurchase but I did enjoy it. This is hands down my favourite hairspray of all time. One bottle lasts for SO LONG and the texture is not sticky whatsoever. It holds my curly and straight styles flawlessly, and always feels touchably soft. I will definitely repurchase this hairspray since it's perfect for my thin hair. Bonus, the scent is soft, unisex and overall great. I first wrote about this ingenious product here in a "What's on my Desk" post and have loved it at work ever since. With a tiny travel size starting at only $12, this is an irreplaceable makeup kit essential for refreshing, rejuvenating and recharging the skin. The fragrance is so spa-like and can't be beat. I started taking zinc as part of my nightly cocktail to boost immunity and help avoid/heal breakouts. I think it works for me. I have dry eyes and combo skin, so Omega-3 supplements have been highly recommended for me from my doctors (eye & GP). Since I don't eat fish often enough most weeks, I always take 1-3 of these pills every night. So many women have low iron, myself included, so I take an iron supplement (in addition to a daily multivitamin) about every other day. This thin, cucumber-scented body lotion was such a treat to use. It soaks in extremely fast and leaves my skin hydrated and not oily for the entire day. No itching here either. Would repurchase for sure! Nivea body milk is my favourite "drugstore" priced moisturizer on the market. It feels very luxurious and doesn't leave a film on my skin - it is a step above Skinfix in the hydration department - I love this one for winter and would highly recommend. I would do away with every other dry shampoo for this one right here. NIOXIN is killin' the haircare game (see why here) and this dry "cleanser" absorbs oil, eliminates odour, adds texture and never irritates my scalp. You have to try it! Even though I believe that NeoStrata has some of the best chemical exfoliants at the drugstore, this product didn't live up to the rest of their line. I have trouble with foaming products overall and this one smelled weird and didn't do much for me. If you want a "resurfacing" product, use a liquid exfoliant from the brand. Dubbed nature's best resurfacing retinol treatment, Rose Hip Seed Oil is great for helping you achieve a clear complexion. Moisturizing, repairing, resurfacing, and calming. If you like oils, this is a good one to apply on the body as well - it does smell a bit earthy though. I loved this oil-based makeup remover. I only had the small trial size, but I would recommend the product overall because a little goes a long way. It doesn't replace my L'OCCITANE Immortelle Oil Makeup Remover, since it doesn't wash clean as easily, but it's a good alternative. A great anti-redness daily lotion for those with rosacea or very sensitive skin. After trying this sample of PFB I received the full-size from my esthetician Jane at The Wax Studio in Toronto. This is the best product on the market for reducing ingrown hairs, scarring and spots after waxing and shaving. I really liked the simple promises of this collection right when I got it from Smooth Wax Studio, but that didn't last long. The lavender fragrance went extremely sour after a year (I know, I don't use things fast enough) so I had to toss it. Yes yes yes! I voted this product as the best exfoliating toner at drugstore as part of FASHION Magazine's Beauty Review Panel, and my opinion stands true today. First reviewed here, you can't go wrong with this simple, chemical exfoliant that promises clear, even skin with daily use. Try it! A simple oil-free refreshing mist for the face. I didn't like the scent or how this sometimes made my face feel sticky, so I wouldn't repurchase. Loved this light body wash since it smells like heaven and is gentle on my skin. So enjoyable to use, feels super high-end and works well. Especially for the price, I'm not into this. It's a bit too gimmicky with the gel-to-liquid texture that can get really difficult to apply. My glob of moisturizer ended up on the floor 50% of the time. I found the finish to be hit-or-miss, often feeling like a layer of dry sticky liquid on my face. For a similar but better product, try out the alternative from Dermalogica. This AHA Cream is my favourite Miracle 10 product ever. It's a lightweight moisturizer packed with one of the best Alpha Hydroxy Acids for sensitive, acne-prone skin: Lactic Acid. Would recommend for sure! el-oh-el. No formula could justify this price tag, so I'm sorry G it's gotta be a no from me. I liked this product under the eyes, but not for the lips. This was a nice product for acid-toner and moisturizer in one! It definitely made any active breakouts BURN badly, so beware if your skin is very reactive. Would recommend though since it's super smoothing and good for clearing congestion. One of my fav high-end mascaras! Good for building volume and doesn't flake when the tube is brand new. I find that it's total crap once it starts to dry out though, which is disappointing. This is an incredibly fruity perfume that smells like fresh orange peel. One of my favourites, I layer it with the Vanille Insensée. This is a lovely collection from Vichy! I reviewed it in a video here which has gotten so much love. I wouldn't repurchase because it has a strong fragrance, but it definitely works well. Such a sad day, because this lipstick was released for the holidays 2 years ago and is no longer sold! But bless the brand and my girl Samantha Jane YT for providing me with 2 backups. This is a gorgeous velvet matte cool-toned pink lippie that I simply adore for giving my complexion a little pick-me-up. A great find from the drugstore, this self-sharpening brow pencil is cheap and cheerful - I reviewed it here. I think the self-sharpening aspect is a bit wasteful, I don't think this lasts very long. But the brow pencils from Annabelle are some of my favs at the drugstore nevertheless. Wow. This is truly a gorgeous serum. It literally gives life to your skin, and will absolutely improve texture, tone and reduce wrinkles overtime. So pricy but really wonderful on the face. I got a sample in a TopBox. The sister to the beloved Hydrabio Serum, combo or oily-skinned peeps will love this. Fragrance free and really lovely under makeup. This hybrid mask-exfoliant is a really nice product for super sensitive skin, and I just mentioned it here. I didn't find that it was "intense" enough for me, but it would be good for those who get red or irritated easily with acid-based products. You need to try this intoxicatingly delicious mint bath soak that makes you feel like a million bucks, especially after a long day of walking or a workout. See more here in my full review. This is a very nice bath soak to elevate simple epsom salt. I like the additives in Bathorium products, natural and effective at helping you relax and unwind. I think this is a wonderful alternative to something like a LUSH bath balm which might be a bit messier. Also, made in Canada! I think I am definitely in the minority of folks who find that this mask is too harsh! Between redness, tingling and burning, I can't use GlamGlow Supermud. So I guess it's great for those who have skin that's tough as nails? 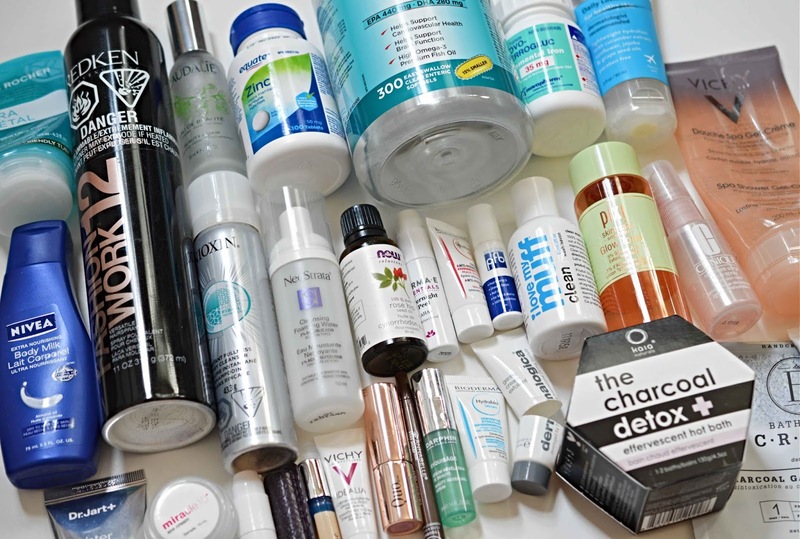 See all my previous empties posts here.